It may be 'tis the season, or it may be pure nostalgia, but I love making Christmas cookies. I distinctly remember one specific year growing up when my mother and I spent the day baking Christmas cookies. It was extra special because my mom allowed me to play hooky from school that day so we could bake the Christmas cookies together. I was the third child so it was a rare opportunity to be able to have time with my mom all to myself. It's a day and a memory I will always treasure. But back to the cookies, especially a favorite to us Michiganders and Midwesterners alike - the Buckeye! Not the nut, but the cookie. Super simple, super easy, and super delicious. Yields about 2 dozen, depending upon size. PART 1: Line a baking tray with parchment paper. In a medium sized bowl combine the peanut butter, powdered sugar, and butter. Using your hands, mix together until the ingredients are blended and form a soft yet sturdy consistency. With those same hands (don't wash them just yet!) pull apart about 1 Tablespoon of mixture at a time and roll it in your palm to form a ball. * Place each ball one by one on the parchment paper. Set in the freezer for a minimum of 10 minutes and a maximum of 2 days. PART 2: Remove the peanut butter balls from the freezer. Melt the chocolate and butter over very low heat, stirring continuously, careful not to burn. A double boiler is helpful, if you have one. INSIDE TIP: If the chocolate seems thick, add a little milk, stir and combine with the heat. This should loosen it up to make it easier for dipping. ** Dip the peanut butter insides, one by one, into the chocolatey coating and place back on the parchment paper in a row. 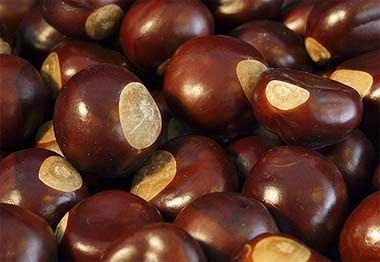 Place the buckeyes back in the freezer for 30 minutes and remove when ready to serve. * If the mixture is too sticky, add more powdered sugar. If the mixture is too dry, add more butter. ** My mom used to poke a toothpick into the ball (slightly de-thawed) to dip into the chocolate, but I've become lazy and just swoop right in. Either way works, and remember, homemade is better when you can tell it is homemade, so don't strive too hard for perfection here.